A 16-year-old Lehigh Valley girl who went missing for more than a week was found Saturday in Mexico by U.S. Immigration and Customs Enforcement (ICE) officials, culminating a search for the 45-year-old man suspected of conducting an inappropriate relationship with the girl. 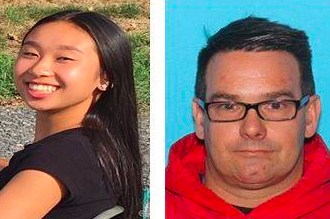 Amy Yu and Kevin Esterly, both of Allentown, were found by U.S. Marshals and Mexican authorities in the resort town Playa del Carmen, located in the Quintana Roo on the Yucatán Peninsula, according to The Morning Call. Both were returned to the United States and Esterly, a married man and father of one of Yu's friends, was arrested on a felony charge of interfering with the custody of a child. Secret details surrounding the relationship between Yu and Esterly began to surface after the pair disappeared on March 5. Two days later, Allentown police notified the public that the two were missing and possibly endangered. Esterly reportedly checked Yu out of Lehigh Valley Academy Charter School nine times between November 2017 and February of this year. Yu had listed Esterly as her stepfather on school records without informing her parents, according to authorities. When the alarming pattern was detected in February, Esterly was barred from school grounds and a series of disagreements allegedly arose between Yu's mother, Esterly and his wife. Allentown police told the Esterlys to stay away from the teen's home when the responded to a call on Feb. 15, according to court records. Investigators said Yu and Esterly boarded flights from Philadelphia to Dallas and Cancun on the morning of March 5, the same day Yu's mother reported the girl missing to Allentown police. Yu reportedly left willingly. She and Esterly both purchased their one-way tickets with money stolen from their families, police said. Mui Luu, the girl's mother, said last week she discovered the alleged romantic relationship Esterly and her daughter when she found suggestive text messages on Yu's cellphone. An attorney representing Esterly's wife told The Morning Call her husband's close relationship with Yu goes back several years and is documented in a series of Facebook photos he shared from 2014 to 2015. The father of four, a concrete contractor in the Lehigh Valley, allegedly escalated the relationship last summer, leading to months of conflict with his wife. Mexican officials issued an Amber Alert for Yu and Esterly on March 15 when it became clear the two had left the United States together. While Yu is 16, the age of consent in Pennsylvania, authorities are proceeding with the custody interference charge. The attorney for Esterly's wife reportedly said she has retained the services of a divorce lawyer and believes Kevin Esterly is not in a mentally stable state. Luu pleaded last week for her daughter to come home safely. "I want to tell her, 'Amy, can you come back to me?' I love you,'" Luu said in an interview on "CBS This Morning." "I just hope you come back."